The robber, who threatened a couple with a knife, made off with an undisclosed amount of money. 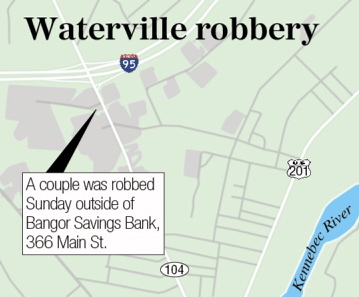 WATERVILLE — Police on Monday were still searching for a man who reportedly brandished a knife when he robbed a man and woman who were trying to make a deposit at Bangor Savings Bank on Main Street Sunday afternoon. Police were working with the bank to review video surveillance from the time of the robbery to get a better description of the robber, Waterville Police Chief Joseph Massey said Monday morning. The robber was described in a news release Sunday as a white man, average height and in his 20s. Massey said there were some discrepancies in witness descriptions, and police are viewing video surveillance from the bank before they release a more detailed description. By Monday night, police had not released any additional details about the case. The man approached the two people, who were in their car to make a deposit, and threatened them with a knife, police said. He took an undisclosed amount of cash and ran off toward Home Depot a little after 2 p.m. on Sunday, police said. Police from Winslow, Oakland and Fairfield responded to the robbery, as did Maine State Police, but authorities were not able to find him. Police are asking anyone who was in the area of Waterville Commons Drive during the time of the robbery to call the department with any helpful information at 680-4700.